Peru's ex-President, Alberto Fujimori, cannot hold any public sector job or head a party list until 2011, the electoral tribunal has confirmed. 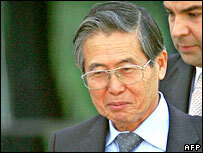 An official from the alliance led by Mr Fujimori said the move was political. The group would have to decide whether to appeal against the decision or replace Mr Fujimori as leader before the 2006 election, Martha Chavez said. Mr Fujimori has been in custody in Chile since arriving there from self-imposed exile in Japan last month. Peru is seeking Mr Fujimori's extradition to face a number of charges, including corruption and organising death squads. He has denied any wrongdoing, and says the charges are aimed at preventing him from standing for president in April's poll. Mr Fujimori - who was president between 1990 and 2000 - fled to Japan after his government was embroiled in a corruption scandal. From Japan he sent a fax renouncing his post. Peru's congress then barred him from holding any public office for 10 years. Despite the ban, Mr Fujimori vowed to return to Peru and run for the presidency as head of the Si Cumple-Cambio 90-Nueva Mayoria alliance. The electoral tribunal said the alliance would be allowed to register for the elections again if it withdrew Mr Fujimori's name from its list.